I have to pass this resource on to any Mamas out there or anyone with children in their life. Hatley-Grace and I have enjoyed Songs For Saplings so much the past few months. The Question and Answer CDs are basically catechism questions and rich theological truths put to music. The CD's are packed with scripture and Hatley-Grace loves the music as well. 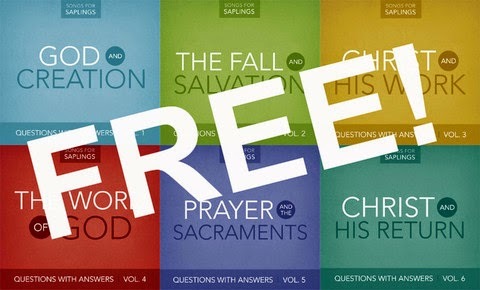 All 6 question and answer CDs are available for free digital download. I play these all the time, while we are playing, eating meals together or in the car. 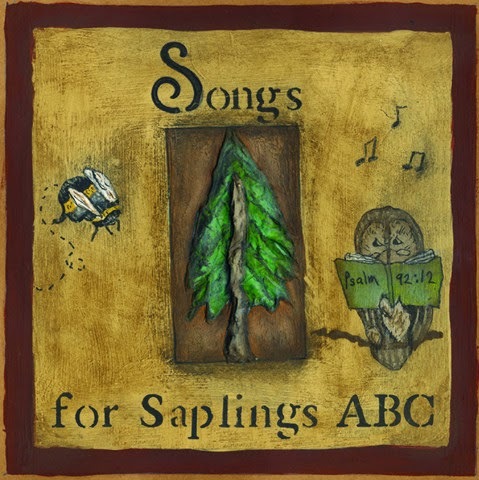 Also, the Songs for Saplings ABC and 123 are available as well. My Aunt gave us the ABC CD for Christmas and it is now a go to CD in the car. This CD is full of short songs that are purely scripture put to music. I hope you enjoy them with your kiddos! Click here to download! Diapers: flip medium length 4 snaps in, these have been a big pain recently with lots of leaking. Any advice would be greatly appreciated. Hatley-Grace had some battles this month with not wanting to go to bed, but most of that was probably related to our schedules being so busy with the holidays. She normally goes to bed between 7:45/8 and wakes up around 7:30. She takes one nap from around 1-3. One of my favorite times of day is when she wakes up from her nap. Usually Giada is on the Food Network and she sits with me and her cup on milk and we watch Giada cook. She loves when her daughter Jade is on the show the best! 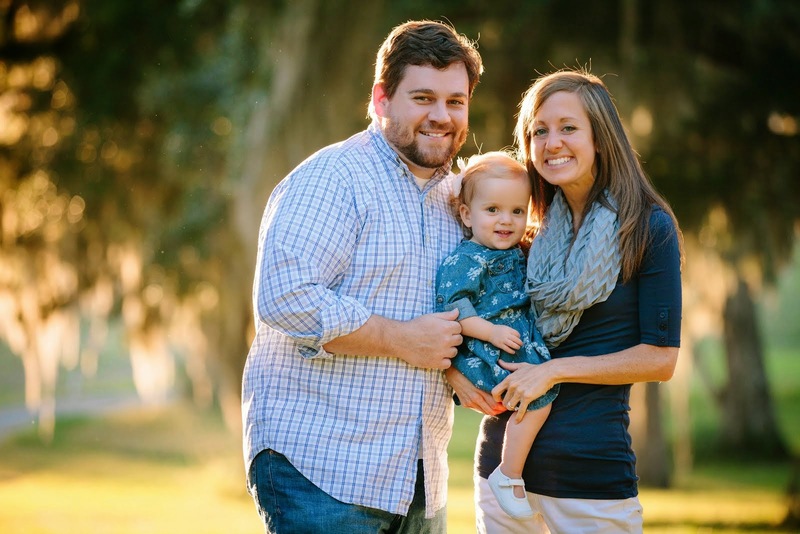 Hatley- Grace is a good eater and eats mostly what we eat. She has started going in the pantry and requesting crackers, Cheerios or rice cakes as her snacks. She prefers vegetables to fruits, and has tried lots of citrus this month since it is all in season right now here. Hummus, pita and cucumber is a recent favorite. She loves anything Mexican, quinoa salads, peanut butter, bread, eggs, bacon, oatmeal, plain yogurt with honey, all veggies and fruits. HG's vocabulary has taken off this month. When asked she will try to repeat any word you ask her to and everyday something new pops out of her mouth. Some words she says often are dog, cat, bird, duck, bug, water (wawa), milk, cracker, eggs, bread, cheese, Cheerios, snacks, apple (ap), banana (nana), mama, dada, church, Iva (ivvv her friend), Josh, Bethany (bef), book, more, no no, hot, baby, happy, bike, ball, bus, eyes, nose, mouth, ears, toes, shoes, hair, please, Bible...wow this list is much longer than I anticipated. Language is exploding right now. These photos should be a good picture of how active HG is right now. I can barely capture a still moment. HG confidently walks and is beginning to trot, not yet run. She climbs into her rocker and kicks a ball. She would walk all over the house and yard, and explore all day if we let her. She colors with crayons and chalk, mostly making lines vertically and horizontally. She cracks eggs in her kitchen, stirs with spoons and loves to cook and bang the pots and pans. She enjoys sorting her blocks in the shape sorter, stacks blocks and puts money into her piggy bank. 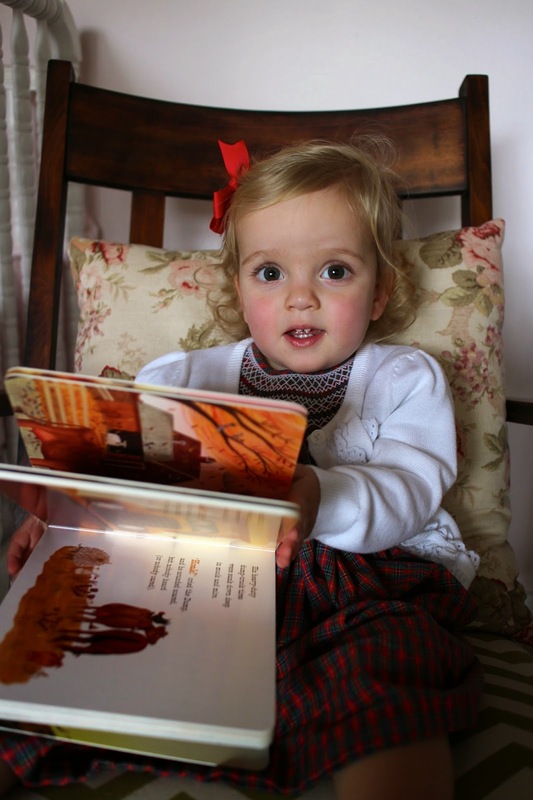 - Hatley-Grace is known to wake up and ask for church and Iva, her friend, first thing in the morning. 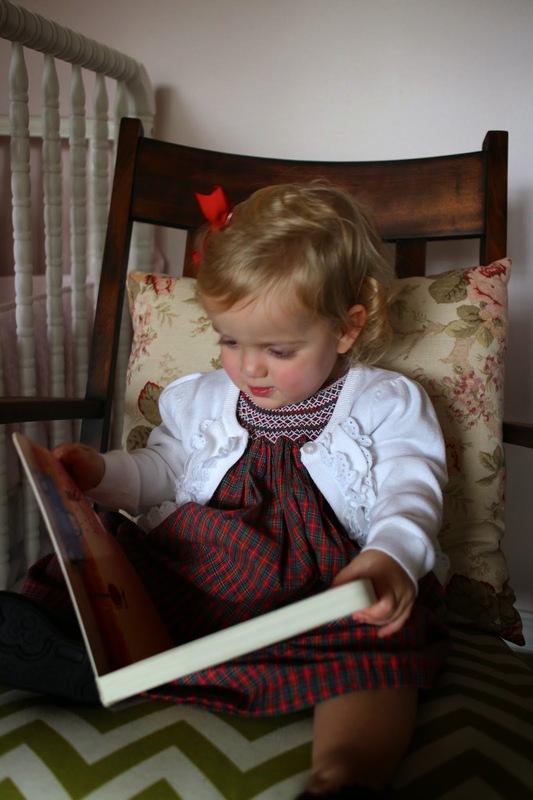 - Books are a favorite all day long, we hear lots of "more books" in this house. - I started doing a catechism question with HG in the mornings, and when asked the first question, "who made you?" she can now shout "God" very proudly. Also, when we pray she says "amen" at the end. - She will say phrases like, "good girl!" and "oh no!" - She has just started to have an interest in the TV and will ask for "George", the Curious George show on PBS. - We go on lots of walks together still, but now she talks almost the whole time especially when I try to listen to a sermon or podcast. 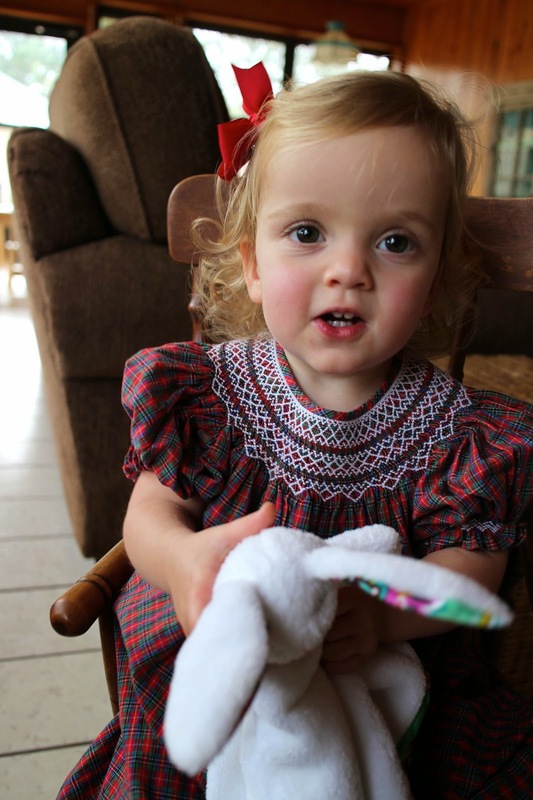 - Her curls and long eyelashes are still her most prominent features. - She stared using the potty this month and is showing a strong interest in it. I think we will dive into true potty training soon. You are growing and changing so fast. You are saying new words everyday. You sometimes whine and fuss when you need something, but when I tell you to ask for help you can! You waddle around our house in your big girl sneakers and your big cloth diaper bottom like you are off on a new adventure and it is just precious to watch. You have a huge amount of energy from the moment you wake and go strong all day long. You are such a ham when other people are around. You are very fond of boys, and flirt by burying your face in your hands or lifting up your dress to cover your face. You love being outside, watering the plants, playing in the water table, picking oranges from our tree or finding all the acorns in the driveway. You study the world around you and learn by exploration. We went to through a week after the holidays when you just fought going to sleep at night. Sometimes is was 9 before you settled. You learned to ask for more books, wawa (water), milk, blankets, anything to plead for me to come in. After a few days of late bedtimes in a row, Daddy was home and I graciously gave him a turn. He told you at 7:15 that you were going to drink milk, read books, brush teeth, sing and go to bed. He walked you through each step of the process, and you easily went down at 7:45. #1, Daddy teaches me lessons in patience and love everyday. #2, you understand and comprehend so much! You listen and mind us well, especially your Daddy. You want to know whats going on as much as we as adults do. Every night since then you have gone to bed without a fight, even if we have been at youth group or at games. You love hanging out with the big kids at youth group and let the sixth grade girls tote you around like a dolly. You run the halls with the kids at school when we are at basketball games. After fun play times like these, you ask for Mama as it gets later, which melts my heart. I love that you are fine with separation, but desire time with me as well. We love you sweet girl and love watching you grow!